Plate Bill Mountain Toucan (Andigena laminostris) is a native of the Pacific slope of Ecuador and southwestern Colombia. 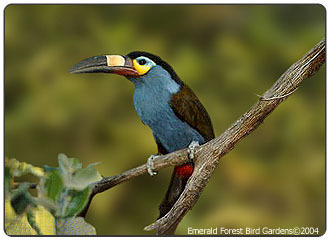 It is one of four mountain toucan species and the only one in captivity in the U.S. where it is very rare. Only a handful were ever imported, and while a few were bred, the species never took off. Mountain toucans are quite extraordinary in that they live at very high elevations, approaching 9,000′ in Ecuador, Colombia and Peru. Today there are less than six known specimens in the U.S.
First captive breeding January 4, 1975; Los Angeles Zoo.